When have you experienced inauthentic leadership? How have you been inauthentic with someone who looks up to you? How are you intentionally growing as a leader? Are you growing toward authenticity? Be honest. Honesty seems like an assumption in leadership, but don’t take it for granted. In order to be honest with others, you must be honest with yourself. In order to be honest with yourself, you must be honest with God. Sometimes there is stuff in our lives which we’ve ignored, hidden, or distorted for so long that we don’t know the reality of where we are. It’s time to get real and grow. Know doubts. There’s a significant difference between “know doubt” and “no doubt.” Whether you admit it or not, you have doubts. When you don’t acknowledge your doubts, they undermine the influence you have on others. It’s important to struggle through and talk about your questions, one at a time, and pray for guidance and answers. Acknowledge vulnerability. What you don’t know can hurt you. It’s important to know you’re not indestructible or impenetrable. You are susceptible to stress, temptation, detachment and much more. Vulnerability isn’t a weaknesses; it’s a part of life. Failing to accept it will only result in being blind-sided in the future. Listen. Be genuinely interested in others’ lives. As you connect with someone, both lives will be nourished. Invest in others, and learn from others. Do what you say. Nothing screams hypocrisy louder than a leader who teaches one thing and does something contrary. Don’t teach anything you can’t live out unless you’re willing to share how you struggle. No one has all the answers. Once you accept what you don’t know and have, people will respect what you do know and have. Live It. Choose one of the tips above and put it into practice today. Talk, teach, share, listen, live, and lead authentically. When and how have you received hospitality? When and how have you extended hospitality? How have you struggled to extend or receive hospitality? Receive It. Authentic hospitality is an attitude and an action. It happens inside our hearts, inside our homes, and beyond our walls. Hospitality is how we approach, nurture, and treat others. Hospitality is sharing what we have with others. We can become focused on what we’re physically sharing with others: we donate clothes, we share a meal, we give money. All those things are great, but motivation matters. If we set aside how we’re hospitable with our physical surroundings and material possessions and focus on our spiritual hospitality, our hospitality authenticity will grow. Consider the fruit of the Spirit. But the Spirit produces the fruit of love, joy, peace, patience, kindness, goodness, faithfulness, gentleness, self-control. There is no law that says these things are wrong (Galatians 5:22-23). The fruit of the spirit grows from within us. God’s Spirit nourishes and produces these qualities in us as we yield to Him. We then share such qualities with others, because they impact everything we do. Authentic hospitality comes from the fruit of the Spirit, because as we share the Spirit’s fruit, we cannot help but to be hospitable in the way God intends. We share love, joy, peace, patience, kindness, goodness, faithfulness, gentleness, and self-control with people around us: family, friends, acquaintances, neighbors, strangers. Live It. Exercise hospitality with the fruit of the Spirit today. Write the fruit on an index card. Look for opportunities to share each quality today. Remind yourself of the list by glancing at it regularly. As you share hospitality, put a star next to the fruit shared. Ask God to continue to produce fruit within you and guide you to use it to be hospitable in ways that glorify Him. What kind of trouble are you in right now? How well do you do at asking for and accepting help? Is there a difference between the help you’re willing to give and the help you’re willing to receive? Receive It. We tend to define trouble in a variety of ways depending on what will best meet our comfort. We don’t have to be in trouble to have trouble. Trouble is more than what you get yourself into; it’s part of everyday life. Some trouble is more troubling than others. However, we don’t need to do as much rationalizing as we do. You might have a tendency to distort the smallest trouble into a major trouble. You might prefer to downplay your troubles in light of someone else’s troubles. You might handle big troubles well but buckle under the smallest trouble. You might appreciate being able to help people with worse troubles but then get frustrated that no one is helping you through your troubles even though they might seem minor in comparison. Are you asking for help? We need to stop comparing our lives to others, and simply start sharing our lives. There will always be people in more and less troubling situations than you. God intends for us to share. When we share where we are and what we need with each other, we give and receive. Scripture says it’s better to give than to receive (Acts 20:35), but that doesn’t mean we never receive. Our focus should be what we can give to others, but God expects us to receive. He expects us to receive from Him. We don’t have what we need without His provision. He also expects us to receive from others, because it’s how they give. You will find joy in giving, but you rob someone of that same joy when you refuse to receive. It’s not comfortable, but you need to ask for help. God intends for us to live life alongside each other, and that includes both giving and allowing others to give. Live It. Ask someone for help today. It can be something small, but challenge yourself to ask someone you wouldn’t normally ask. Don’t ask your family or employees to do something you’d regularly ask them to do. Step outside your comfort zone, admit the need for help, and ask for it. Do you stick to commitment like super glue or avoid it like heavy-duty repellent? What’s a positive experience you’ve had with commitment? What’s a negative experience you’ve had with commitment? Receive It. Following God involves sacrifice, effort, and devotion. We want healthy spiritual growth in a no-fuss, low-effort 15-minutes-a-day, but that’s not possible. God welcomes any effort we give Him, and He will use any sacrifice we give Him to help us grow, but our spiritual growth exponentially grows in the depth and breadth of our commitment. Authentic commitment can’t be assessed by a checklist, so avoid looking at someone else’s life and believing she must be so much more committed and spiritually mature because of her outward actions of faith. At the same time, hesitate letting the list of what you do determine your spiritual health. Authentic commitment is about your heartitude. God knows your heart. Growing faith requires an ever-opening heart. Our hearts are never open enough to God during our lives on earth, because God’s perfect plans know just how many moments we’ll be on earth and how to maximize each moment. There will always be room for growth as long as we’re breathing. Spiritual growth comes from a commitment to right living, which is living God’s way. We become familiar with God’s will, and we live out His teachings in obedience. Our commitment isn’t one-way. Remember, authenticity is “being actually and exactly what is claimed.” As Christ-followers, we claim to reflect God. Our commitment is a reflection of His commitment, and He is certainly committed to us. God created us and gives us guidelines for living, a plan for eternal life, and so much more. He will never break His commitment. Follow His example. Live It. In His book SoulShaping, Douglas Rumford writes, “We make our commitments, then our commitments make us. Once they are chosen, many other choices follow as a matter of course.” Be intentional in your choices today. When have you caught an infectious smile? When have you been desperate for a smile? Who do you think of when you think of a welcoming, joyful smile? Receive It. There are so many styles of smiles. Lip smile: No teeth allowed. Cheesy smile: Lots of teeth mandatory. Twinkle smile: (also known as the smize): Accessorized by sparkling eyes. Sweet smile: Accompanied by pinchable, (often) chubby cheeks. Wry smile: Indicates orneriness or unshared information. Body smile: The whole body gets involved! Then there are the fake or forced smiles, but let’s not focus on them. 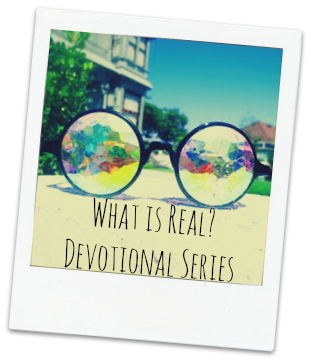 After all, they’re not authentic, and devotion time is all about authenticity. Our smiles (or lack of smiles) say so much to those around us. We can send unintended messages to those around us. Perhaps you’re preoccupied and have a slight frown on your face when a child asks you to spend time with her. Perhaps your twinkle smile emphasizes your words of thank you as a friend gives you a gift. Your simple, reassuring lip smile helps the stranger beside you in line have a little more patience. Your smile comes from within. It’s a reflection of the joy inside you. It bubbles up and cannot be contained unless you’ve trained yourself to mask expression. Masks only rob you and those around you of a joyful life of authenticity. Let your smile be real. Share with others and let others share with you. Live It. Challenge yourself to create a viral smile today. How many people’s eyes can you meet and pass along a smile? What’s your idea of rest? Do you prepare for rest, or do you wait until you have “extra” time to rest? How do you actively rest in God’s presence? Receive It. It’s in rest that we recuperate. It’s in rest that God restores us. It’s in rest that we have checks and balances, so instead of creating and completing our own to-do lists, we’re quiet long enough to inquire, “Yes, Lord?” When He answers, we can confidently proceed with “Yes, Lord!” God’s rest is not an easy road of peace and tranquility with freedom from all risk of enemies. Spiritually, the rest God promised is a way to eternal life with Him. The difference between rest and laziness is that laziness is not productive; rest is. Rest is given and blessed by God. It draws us closer to God, because when we rest in His presence and will, we’re relying on Him. We’re submitting to Him as our authority. We’re humble in His provision. When we’re lazy, we’re deciding what’s best for us. We’re “resting” in our own presence. We’re withdrawing from everything around us, including God. Our priority is ourselves over relationship with God. God’s rest is a peace of mind or spirit regardless of the situation. Because of God’s presence, He is giving us constant, reliable support. His rest isn’t always easy to accept, but it is always supportive. God always knows what we need when we need it even when we feel uncomfortable where He has us. God’s provision of rest is not a stopping point; it’s a door that ushers us into the best He has for us. He is reserving the best for us. All we have to do is remain in His presence, trusting Him for the journey, and what “rest” we reach is beyond our comprehension. God’s rest is productive, so when we rest in Him, we are productive as well. Live It. Quiet yourself today. Rest in His presence. Prepare a quiet place and situation for yourself and set your alarm for three minutes. Let God restore you, then respond in obedience. When have you been hurt by someone’s words? When have you spoken harmful words? When have you been silent when you should have spoken or spoken when you should have been silent? Receive It. We often use the biblical verse “speaking the truth with love” to justify something we feel needs to be said to someone. Perhaps it does need to be said, but let’s commit to the biblical context instead of using the words to rationalize our preferences. Consider three important words included: speak, truth, love. 1. Speak. When we speak the truth with love, we have to actually say the words. We can’t simply wish someone would read our minds. We can’t hint around. We can’t make assumptions that someone knows or will be told by someone else. 2. Truth. Truth is defined by God. We don’t get to decide what the truth is. What we share as truth is often a preference or judgment coming from ourselves instead of from God. Be certain what you’re speaking as truth reflects God’s truth. 3. Love. Our love is defined by God’s love. We’re created in His image, and He pours everything we need into us, including love. We can justify not saying something because of love or saying something harsh because of love, but only God gets to decide the right response in love. Speak, truth, love: three cords that are intricately woven together to create a strong cord. Live It. Today’s challenge is a bit different. Breathe. That’s it. When you are getting ready to speak, take a breath. Take a moment and let God pour into you a conviction of whether you’re to speak or not. When you hesitate to speak, take a breath. Take a moment and let God pour into you the courage to speak out or refrain from speaking. Trust God’s timing, and commit to speaking the truth with love.